How long should you grill salmon on a Cedar Plank? 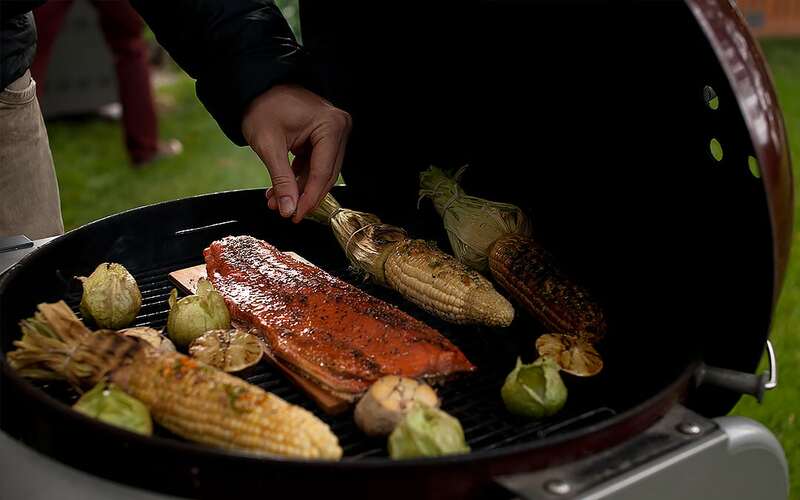 When cooking Cedar planked salmon on the grill, it generally takes 10 to 15 minutes for the fish to be done. However, there are several components to consider, including the thickness of the fish and the preferred degree on doneness. A thermometer to gauge the exact temperature is essential. I recommend digital for an instant reading, which allows for less time with the oven door or grill lid open. 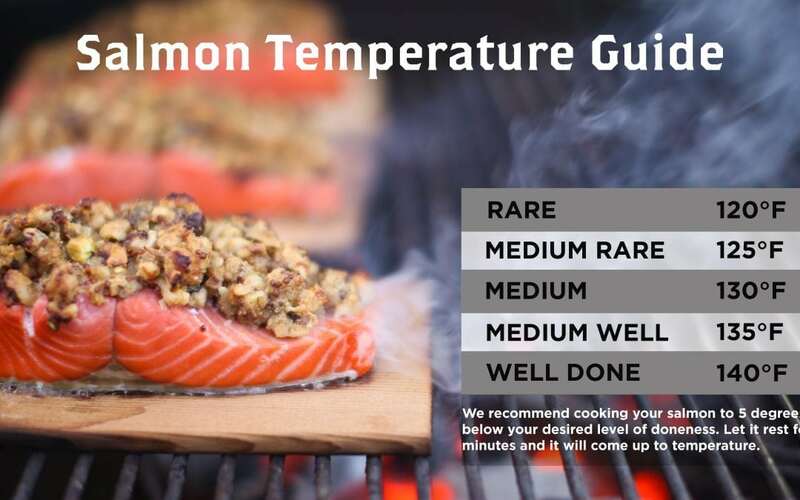 The powers that be recommend you cook your salmon to an internal temperature of 145°F, which we call ‘killing’ or overcooking your fish in the restaurant business. Pro tip: To get a good medium rare, an internal temp of 120°F and a 5 minute rest time is perfect. For a medium temp, bump it up 5 degrees and so on for medium well and well done. See the chart below. Always rest your fish untouched for at least 5 minutes after cooking on the plank. Resting is a technique used to help food maintain its juices. Residual heat that is in the food after cooking is allowed to dissipate slowly and continues to brings the temperature up by about 5 more degrees. Have you ever cut into a hot steak that didn’t get a chance to rest and horrifyingly watched all the delicious meaty juices pour out? How thick is your piece of salmon? Now that we know how long we want to cook our salmon, we can drill it down. Let’s go with the middle of the road and shoot for a medium cooked piece of salmon, by removing it from the heat when it reaches 130°F. If you preheat the grill or oven to 400°F and our fish is about 1” thick at the thickest part, it will be cooked in about 12 minutes. For a thicker salmon portion add 4 minutes of cooking time for every additional 1/2″ of thickness. If you invest in a digital thermometer, you really can’t go wrong. Keep the oven door or grill lid closed as much as possible to maintain consistent temperature. A 6 oz piece of salmon will take nearly the same amount of time to cook as a 1 lb piece as long as the thickness is the same. Practice makes perfect, and before you know it, you will be able to just look at your fish or maybe give it a poke and you’ll know when it’s ready. Try our Cedar Planked Salmon with Fruit Salsa, the fresh fruit salsa pairs deliciously with the grilled salmon!